Binary Scam Alerts has just received a flurry of severe scam complaints about the Zulander Hack App and Michael A Wright. Innocent day traders have received a barrage of spam emails from different sources illegally soliciting them to register an account with shady and unregulated binary options broker under false premises . If you have searched the internet looking to find a review about this software, please make sure to stay away since our staff of researchers have investigated this app and came to an alarming conclusion. Update: The Zulander Hack software marketing infrastructure is currently being used to promote various business opportunities which end up to be fraudulent. Please use extreme caution. If you look at the image above you will see at least 3 alarming giveaways that are circled in yellow and red to make it easier for you to spot the lie. 2. The streaming and viewers message are exactly the same. 3. The limited license bar at the top corner is also employs the same code. Tradeverify does not exist and the logos are not clickable. Verisign, McAfee Secure, Geotrust, and Symantec are not clickable, and there is no SSL certificate otherwise you would see a padlock on the URL toolbar. Photos are theatrical and taken from image banks such as freeimages.com. Don’t be deceived by their ability to identify your location and address you in a more personal fashion. It just makes the scam that much more effective. “Legal hack churns out up to €1,008 every 5 minutes” is a classic scam line and will inevitably take you down a very predictable road. Signals or Automated Trading Tool? At this point it doesn’t matter what they are selling since I didn’t continue checking the actual software and how it performs. Obviously you will lose your money and some smart affiliate will get his commissions. The only question that is of value to the chat reps is if you have opened an account and deposited with one of their brokers yet. If you ask any other question regarding the performance of the app or the people behind it, you will either be ignored or sent to the members area to register again with a different broker. This is a strong indication for me that there is nothing genuine, legit, or honest about this software so don’t try downloading it. 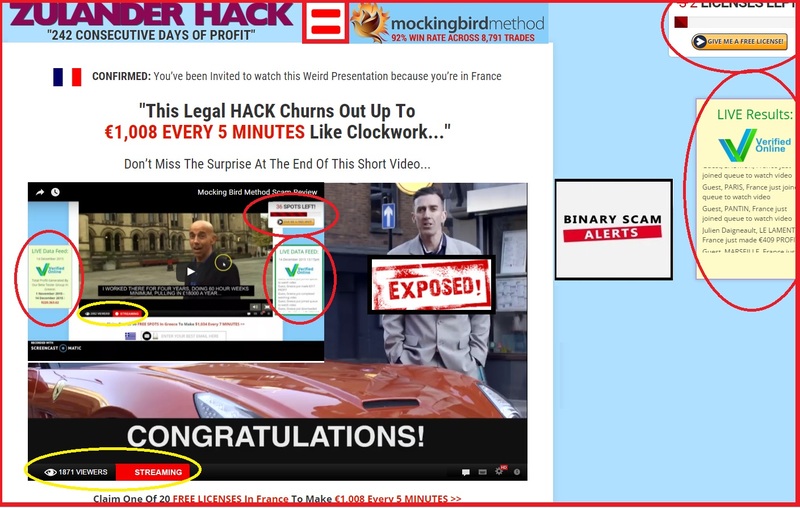 Similar scams are obviously the Mockingbird Method and then you would have a respectable list of fraud apps like Insured Profits, Citidel App, Centument App, Stark Trading, Phoenix Trading Method, The Free Money System by Walter Green, and Channel Ranger. There is only one thing these guys did right and I applaud them for it. At the bottom of their sales page they have an excellent escape clause that clears them of any wrong doing and that is the only good word I have to say about these people. Other than that this thing is a horrendous scam and the chances of you making any profits from this app or anything remotely associated with the Zulander Hack and Michael A Wright the actor are less than slim. If you were curious enough to register with this fake app don’t fund a trading account, and if you have already done so please don’t reinvest unless you are able to find alternate software that will actually enable you to make money consistently. I personally only recommend Virtnext or the Binary Profit Method proudly advertised on this website.